Full Battle Rattle, unconventional Iraq war documentary? Really? There have been several documentaries recently about Iraq. It’s probably Michael Moore’s doing with Farenheit 911, which gave documentary star status and brought it closer to reality TV than quality film making. That sparked lots of low budget on line documentaries, some indeed involving the war in Iraq, and it also sparked a more general interest in documentaries, both on the side of the film makers, as well as that of audiences. 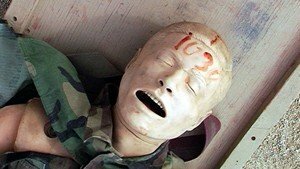 Most documentaries dealing with this war (Farenheit 911, Iraq For Sale, Taxi To The Dark Side, etc.) may have small elements of comedy, in order to break the string of extremely serious issues being discussed, but for the most part are solemn affairs, dealing with death, lies and manipulation. Surprisingly enough, death, lies and manipulation (and the Iraq war) seem to be the main themes of Full Battle Rattle, however they make it funny. And poignant. But mostly funny. The documentary explores a training facility for the US military in the Mojave desert where military units spend 3 weeks practicing for war with hundreds Iraqi and US role players. So the story follows young US troops, Iraqi refugees who are now acting in the war they escaped, as well as veterans playing insurgents. When you first hear of the film being funny you may find it hard to believe. But the trailer is hilarious. There are bumbling young troops who are still training so they may not always get it right, “casualties” covered in blood or with they eyes popped out of their sockets giggling like school girls because they feel silly, and an Iraqi man showing his family a video of himself being beheaded by terrorists, and all this takes place on what the director himself says “looks like a B-movie film set”. It is a very interesting approach to the war in Iraq and I’m sure we will be taken on a journey that will start off with excitement and suspense, only to reveal to us the hilarity of pretending to be at war, then move into poignant passages about the Iraqis that are acting there and are in fact refugees whose families are still suffering back in Iraq, then it will reinject us with some comedy, only to conclude with the young soldiers heading off to war, in a melancholy thoughtful independent cinema shot. Possibly involving a sunset in the desert. I hope it does not. The film’s site talks of unconventional films about war (Dr. Strangelove, MASH, Hearts and Minds) and that is exactly what those films are, unconventional. But how unconventional can you make a film about a war that is still going on and get permission from the military to show it? I want to believe that the film will be exactly as the trailer, it will highlight what a shame it is to send these kids to a country far away to fight and die for a non-existent cause, while pointing out that they are just that, kids, but I’m afraid it won’t. For no other reason apart from the fact that I cannot see them getting away with it. For more information about the film, check out the official website. It includes a blog and the film’s trailer. For the moment, even though I have misgivings, I would go and watch it, so I guess I recommend it. Not the most wholehearted of recommendations, I know, but you should see what I said about Pirates of the Caribbean 3, and that made millions. Of course, there are reviewers (Wall Street Journal, New York Magazine, and the New York Times) who have seen it at screenings and you can find their reviews on the films official site. The film’s world premier was at the Berlin Film Festival, hopefully we should catch it in the UK soon. The 52nd annual London Film Festival includes the talents of Eva Green, Ryan Philippe, Robert Carlyle, Kevin Spacey, Thandie Newton and a flock of fiesty penguins amongst more than 180 feature films. Conquering genres or just making them up, this year’s collection melds hollywood icons and arty-types, and no matter your cinema modus operandi, you’re sure to find something that stirs your mind. And soul. I have just seen “Burn After Reading”. I liked it. I sat in the second row and I was able to see closer John Malkovich’s fake-like teeth. When Brad Pitt was shot, a couple of women shouted behind me. They felt sorry maybe the truth is the shot comes unexpectedly.